The Paravan PR 50 will astound you with its enormous number of functions, yet is still child’s play to operate. At home, at work. Out shopping or at a restaurant. Enjoying hobbies or on holiday. It turns on the spot. With a width of only 64 cm, you’ll easily fit into any lift. You can even drive a car without swapping seats. You won’t find this anywhere else in the world. 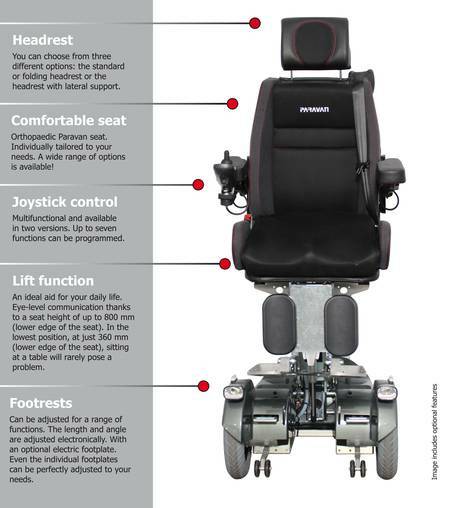 The power wheelchair will be modified for you in every detail. This is ensured by our clever modular system with countless special parts and hundreds of adjustment options. 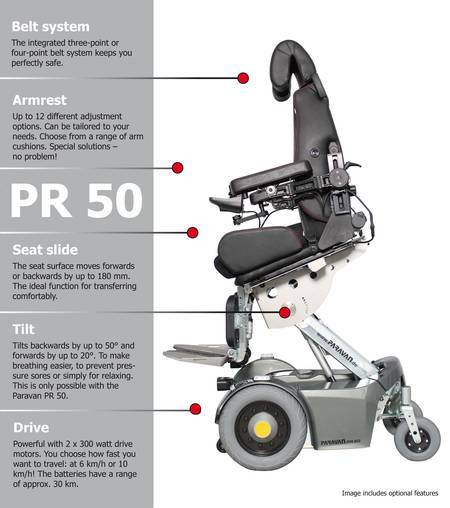 The PR 50 is, for example, already equipped to take respiration apparatus, including special headrests and extra power supply. This wheelchair can be operated safely even by the severely disabled thanks to a perfectly adapted special control unit.